Lets face it. Kids love dinosaurs! There is something about these terribly great lizards (which is what the two Greek root words mean that form our English word dinosaur) that is absolutely fascinating. And, truth be told, it is not just kids who are enthralled with these captivating creatures. Adults seem equally intrigued by these magnificent monsters from mans distant past. Dinosaurs make a tremendous teaching tool due, in large part, to the fact that children are so interested in any- and everything having to do with them. Unfortunately, however, in many instances we as Christians and creationists have, for all practical purposes, abandoned dinosaurs as an instructional aid and allowed evolutionists to use them to further their own cause. That needs to change. And we at Apologetics Press intend to do something to see that it does! To that end, we have been working hard for the past several months in an effort to produce a beautiful new coloring book for children on dinosaurs. I am happy to announce its availability as of this month. As we began this important project, we had in mind several objectives. First, it was our goal to produce a coloring book that would reach children roughly between the ages of 2 and 7. What an impressionable age group this is! We want to instill in their minds from their earliest years the fact that men and dinosaurs did co-exist on the Earthexactly as the Bible teaches. Second, while we want to help kids learn a lot about dinosaurs, we want to teach them even more about the God Who created these range-romping reptiles. And what better way to do both than to create a coloring book that not only gives them something to do, but holds their attention long enough to teach them the truth about their great God and His colossal creation? Third, we set out to print a book that was of the highest quality, yet, in keeping with our long-standing goal of making all of our products as affordable as possible, one that did not do any damage to parents already-strained pocketbooks. I think when you see the new coloring book, you will be convinced that we succeeded. Because a web press was used to print the book, we were able to keep the cost per unit extremely low. At the same time, however, we were able to use good quality materials throughout. The end result is a coloring book that truly has been published with children in mind. It has a beautiful, full-color cover and 32 pages of the neatest dinosaurs you, your children, or your grandchildren ever have seen. Children will spend many an enjoyable hour coloring the pictures and completing the activities (we also included word searches, join-the-dot pictures, mazes, and matching exercises). Plus, we made sure to choose a nice, white, absorbent paper that is user-friendly for kids cavorting with crayonsthe perfect combination for 4 or 5 year olds with a box of coloring utensils and some spare time on their hands. Just dont tell them that they actually are learning while they are coloring! They will be having such fun, theyll never figure it out on their own. At only $2 each, the new A.P. 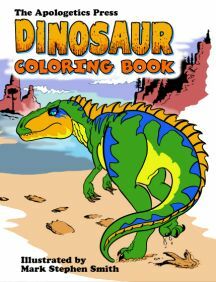 Dinosaur Coloring Book is the best of bargains. It is perfect not only for home enjoyment, but also for Sunday school lessons, Vacation Bible School giveaways, birthday presents, etc. Why not order a dozenor more? If we can be of assistance, give us a call. We are only a (toll-free) phone call away at 800/234-8558.